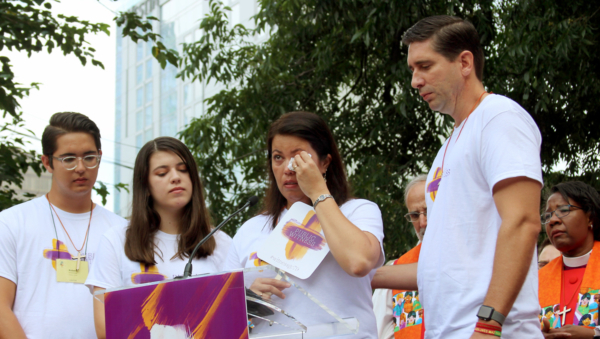 [Episcopal News Service – Austin, Texas] On the gentle slopes of Brush Square Park in downtown Austin and under the canopy of live oak trees, hundreds gathered on July 8 to hear gut-wrenching testimony from Philip and April Schentrup, Episcopalians whose daughter Carmen was one of 17 students and educators killed by a gunman at Marjory Stoneman Douglas High School in Parkland, Florida. Standing on a stage surrounded by dozens of bishops, the Schentrups shared their grief and emotional journey in the aftermath of their daughter’s murder on Feb. 14, 2018. “I was unable to talk, unable to eat, unable to sleep, barely able to carry on,” Philip Schentrup said as his wife April, son Robert, and daughter Evelyn, stood at his side. Carmen was shot four times with an AR-15 rifle by Nikolas Cruz, a 19-year-old former student who walked into the school building, killed 16 others and wounded another 17. The Marjory Stoneman Douglas shooting is one of the deadliest school shootings in U.S. history. 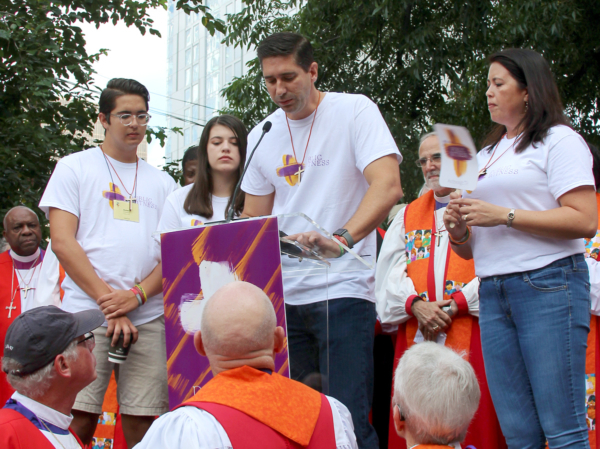 The Schentrups were invited to speak by Bishops United Against Gun Violence, an organization comprised of 80 Episcopal bishops working to curtail gun violence in the United States. 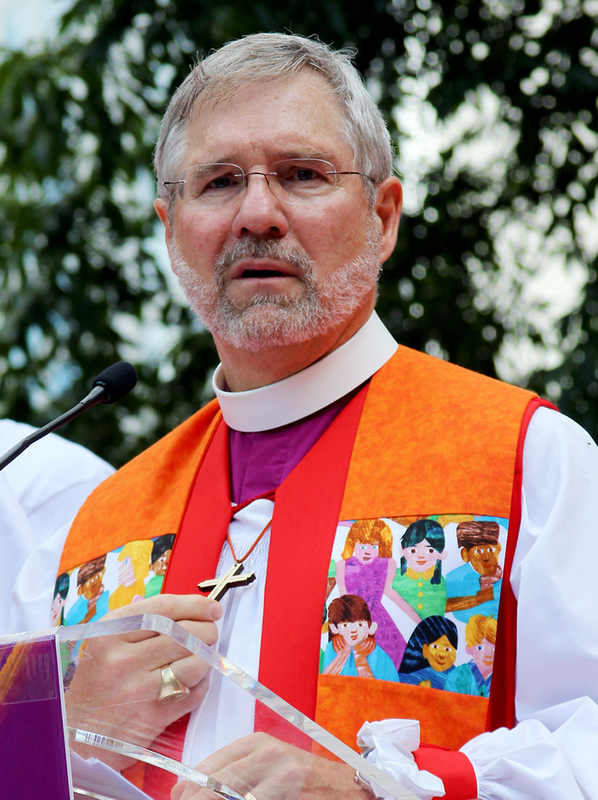 The bishops are in Austin to attend the nearly two-week 79th General Convention, a span during which another 1,000 are expected to suffer from gun violence. Schentrup said that “God gave us free will, the ability to do good, to be complacent, to inflict harm. God gave us the prophets, his son and the Holy Spirit to show us the way. God wants us all to live into his path of love and kindness. I realized that God’s plan was simple. He gave us the ability to choose to love and to care for one another, and he taught us how to do it. Although a daunting challenge, Schentrup said, “I have hope. I hope in Jesus. I have hope in the hearts and the humanity of people. I have hope that just as people of faith led the fight to overcome segregation, laws that demean people, through love we can end senseless violence. “I ask everyone here to step up, to choose to make the world a better place and then to act,” he said. Following her husband’s remarks, April Schentrup told the crowd that as a nation “we have stood by and listened as others have been gunned down in movie theaters, concert venues, places of worship and offices. The truth is in America gun violence happens every day and devastates families. 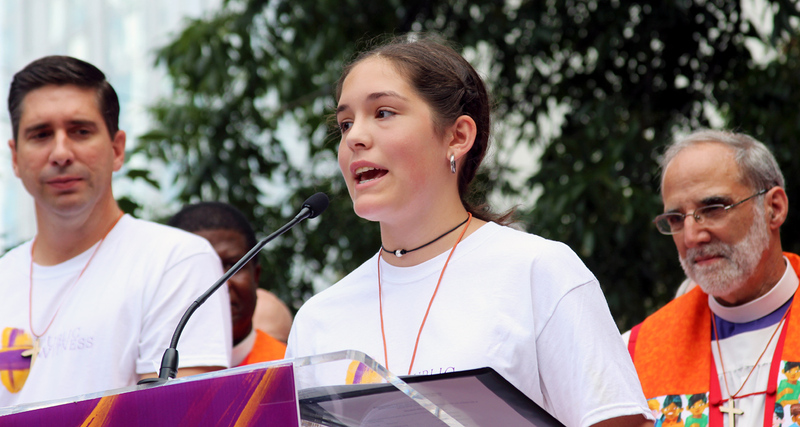 She and her classmates organized the walk-out at her school on March 14 that drew about 300 students and teachers outside to advocate for an end to gun violence. She encourages requiring universal background checks for gun purchases, banning assault rifles, raising the minimum age to purchase a gun and increasing the funding for mental health and counseling programs in schools. Although she has had heated arguments with those who oppose her views, Zimmerman vowed, “I know what I am doing will make a difference, and so I persevere. I am determined to make sure that my little brother, my children, my grandchildren will not have to be afraid of going to school. — Mike Patterson is a San Antonio-based freelance writer and correspondent for the Episcopal News Service. He is a member of ENS General Convention reporting team and can be reached at rmp231@gmail.com. No one condones gun violence. Everyone wants safe schools, where students can feel secure in their learning process. How do we do it? Not with walk outs, demonstrations, and hijacked incompetent hacks like David Hogg. All this kind of stuff is counterproductive, and serves to alienate, rather than reconcile. We can secure our schools, just as we secure airports, government buildings, etc. There are many viable options. I don’t think the Parkland students are incompetent at all. I think their protests are continuing to shine a light on the absurd gun laws in our country. Why can’t we have sensible gun control like the rest of the developed world? Countries like Canada and Australia have sensible laws regulating guns and they have not devolved into dictatorships. In fact, their gun violence is MUCH lower than us as a result. There are many, many gun control laws already on the books. Everyone purchasing a gun legally must go through a background check. Some states have even more stringent requirements before anyone is allowed to purchase a gun. Can you point out an absurd gun law? Australia has confiscated all guns. It is virtually illegal in Australia to possess a firearm unless except in very special cases. What you are promoting is gun confiscation. What we need is better mental health care. No, people can still own guns in Australia, so that is not true. Just like in this country, when they were debating stricter gun laws in Australia after a mass shooting, people were up in arms about how they wanted to take all their guns. However, the laws passed, and the sky didn’t fall. So no, I’m not persuaded by pro-gun arguments that stricter gun laws will lead to confiscation of all guns. That is fear-mongering. And no, the laws on the books that we have are not enough, and even if you’re right that the ones were currently have are not enforced enough, I blame the NRA and other pro-gun groups from allowing them from being enforced (e.g. they basically neutered the ATF). It isn’t the NRA. The number of enforcement actions by the ATF under Obama was half that of the enforcement actions under Bush. Recently a man who made more than 30 straw purchases who resold the guns to people ineligible to buy them received a sentence of a few months in jail. The NRA doesn’t lobby against enforcement of laws and it doesn’t sell guns. As we have seen in London where virtually all ownership of guns by citizens is banned, it doesn’t stop people from committing violent acts. They literally now have stringent regulations on knives. What next, rocks? Guns aren’t the problem. People with mental health issues and who are prone to violence are. It goes all the way back to Cain and able. And a church which has turned itself into a propaganda macjine for the Democrat party has nothing to offer. Taking away guns from law abiding citizens is not an answer. Nor is weakening/eliminating our 2nd Amendment. Arming trained volunteer staff, as well as having armed security staff on site, are worthy options to be explored. No other developed nation has armed teachers to prevent mass shootings in classrooms, nor armed guards. I don’t think we need to add more guns to the situation. I don’t see why we can’t look to other developed nations for solutions to this problem. The act of a monstrously evil man combined with the inaction, negligence and cowardice of others including law enforcement and educational institutions created this tragedy. The firearm was merely an inanimate instrumentality. Let us place the blame where it belongs, not on the firearm. It is time to stop using these horrible tragedies as a justification for gun control. The greater good of our society is best served by protecting and strengthening the second amendment. Why not? Our lax gun laws allow way too many people to get a gun who should not have a gun. Why can’t we have sensible laws like other developed nations (e.g. Canada, Australia)? A complex problem beyond simple solutions. 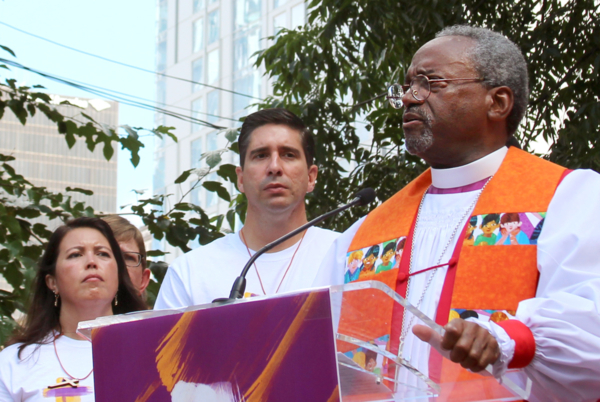 I wish we could focus on ALL violence (spiritual root), not just gun violence (the means). 97% of mass shootings happen in gun free (imaginary) zones and the media and internet with all the attractive attention grooms future perpetrators from an unstable population. The PROMISE Program disallowed the Stoneman shooter’s record of assaults to be placed in his criminal record so there was no deterrent to be found when the NICS check was run. Assault rifles are automatic weapons and already banned. The Armalite (AR) frame is a semi-automatic rifle (one shot per trigger press). Being a licensed therapist as well as a priest I have witnessed that mental health services (spiritual health services too?) are in a shambles. Mentally ill people are often isolated and many do not take the initiative to seek help. Sociologically, the population is so dense today (people rarely know their neighbors) that life has become more impersonal meaning that people are easily lost between the gaps. Prevention is more functional than a cure and both require a stable home environment with a spiritual foundation (The Jesus Movement-thank you PB Curry). The NICS system already exists and works but needs to be tightened up. If you mean a National Gun Registry, that is not the same thing and puts healthy law biding citizens at risk for public disarmament which statistics reveal as more hazardous. Credible, not manipulated, research reveals that armed citizenry have stopped between 1 to 2 million assaults (or worse) a year in most cases without firing a shot. Those numbers alone reveal that a spiritual problem exists due to the number of assaults and intended assaults. I too pray and work for solutions to all violence. Spiritual/mental health with healthy family systems are the the core issue and foundation. I thought the highlight of the morning was Abigail Zimmerman. What an amazing young lady and wonderful family. She demonstrated incredible poise and maturity far beyond her years, spoke with empathy and passion, and continues to provide witness in the heart of Texas, even when it is difficult. She is simply amazing. The right to bear arms is not the necessity to have guns. Guns are simply another instrument to kill someone or something. As a child of God, I am not here to kill anyone or anything. Therefore, I do not need a gun or any instrument of violence. Are not guns weapons of mass destruction?? Yes. Are we not trying to rid our world of such weapons?? Yes. How can we condemn other nations of having/building weapons of mass destruction when we continue to construct such weapons at an alarming rate?? And, I would like to know, who published this statistic that “1 to 2 millions assaults (or worse)” have been prevented by armed citizenry? Oh, yes, that’s the NRA. We talk about “big Pharma” in our opioid epidemic, what about “big Armma” in our killing-epidemic?? Speaking only for myself, I find it disturbing that in this forum we are arguing about and citing the 2nd Amendment when it might be appropriate to be asking ourselves and one another what the Gospel says about this issue. Somehow I don’t think Jesus would be advocating personal ownership of weapons of mass destruction. But as I said, that’s just me. However, the last time I looked, the Constitution of the United States had not been included within the canon of Holy Scripture. I think David Hogg and other shooting survivors are doing good work and I’m glad they are drawing attention to the issue of gun violence in our country. Most of these posts are not looking at the reason the guy with the gun got into the school. There were guards who didn’t do their jobs, police who were told to stand down due to Obama s rule to ignore bad behavior. Have you all not looked at all these reasons? I guess it’s just easier to blame guns. Not very smart.